"This is madness! Total madness." Kino Lorber has debuted the trailer for the documentary Walking on Water, about legendary maverick artist Christo. With uncensored access to Christo and his team, the doc film is a "cinema vérité look at the celebrated artist and his process, from inception to completion of 2016’s most visited art event—The Floating Piers, a stretched 2-mile dahlia-yellow walkway that allowed over 1.2 million visitors to safely walk across stretches of Italy’s Lake Iseo to experience the sensation of floating and walking on water." You may have seen photos of this remarkable large-scale work of art, but there's also a remarkable story about how it came together - and almost fell apart. "The film takes the viewer on a journey into Christo's world, unmediated by interviews, voice-overs or reenactments, drawing a portrait of an artist who deliberately places visceral experience over demagogy." It's also described as an intimate look at "a man chasing (and eventually realizing) a larger-than-life dream. Must watch doc for art nerds of all ages. Enjoy. An uncensored look into the artistic process and personal relationships of Bulgarian master Christo, an artist known for his large-scale installations. For the first time since the passing of his wife and partner, Jeanne-Claude, Christo sets out to realize, The Floating Piers, a project they conceived together many years before. 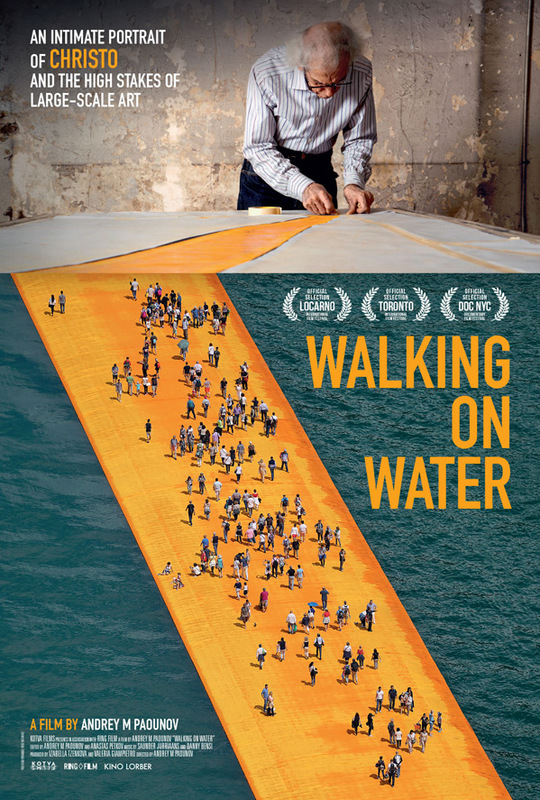 Walking on Water is directed by Bulgarian filmmaker Andrey Paounov, director of the doc films Georgi and the Butterflies, The Mosquito Problem and Other Stories, and The Boy Who Was a King previously. This first premiered at the Locarno Film Festival last year. Kino Lorber will release Paounov's Walking on Water doc in select theaters starting on May 17th, 2019 just next month. Interested in this doc?